Walk by and you may almost miss this cool local resto, but once inside and confronted with the giant blue and white mosaic pizza oven you will instantly know you have found the latest pizza haven of East Sussex. 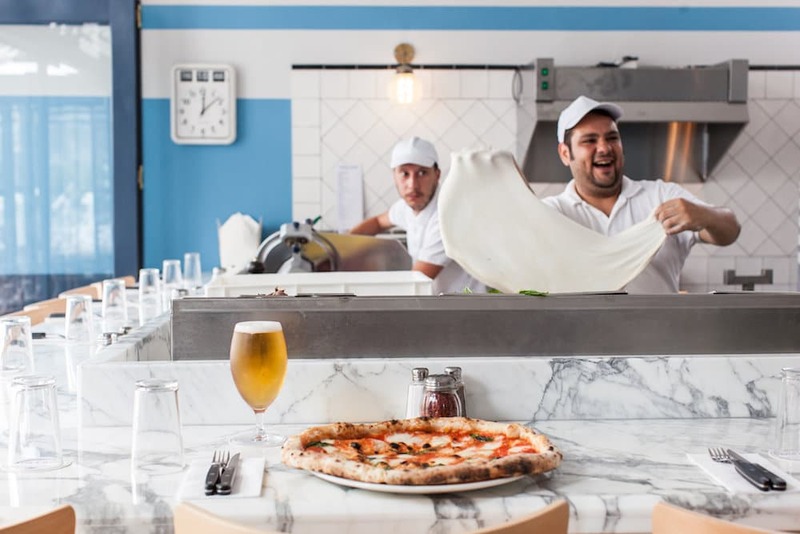 From the same gastro team behind popular coffee spot ‘Bread and Milk‘ (Brighton), Fatto A Mano has a similar relaxed, soft-industrial feel about it with charming exposed brick walls, bright tiled flooring, retro style fixtures and wooden bar stools that face a luxurious marble-topped pizza bar. A little reminder this is no Pizza Express. The menu is simple, basic Italian starters and sides inclusive of the Mediterranean staples; olives, bruschetta, caprese salad, and ‘Campania Fries’ (potatoes made with love and then sprinkled with sea salt and rosemary) or for the meat lovers an ‘Affettato Misto’ – a selection of traditional cured meats. There is also a selection of delicious wood fired pizzas including our favorite, Pizza Norma, and fresh and vibrant salads for those a little less hungry.